We Yashoda Mica & Mining Pvt. 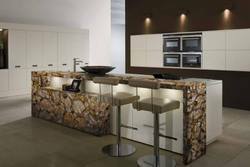 Ltd. Jaipur, Rajasthan Based Leading Manufacturing Unit of Indian Granite and Marbles Products like Stone Worktop . Custom tile and slab sizes as per order. We are offering a wide range of kitchen counter top solid surface. These are fabricated from the superior quality of materials. These kitchen counter tops are in high demand in the market. Different sizes and designs are easily available in the market. M/S. D E C O F U R.
Our client can avail from the repertoire a qualitative range of Colombo Juparna Granite Kitchen Counter Tops. We process this making use of advanced machinery and precision techniques. These are in accordance with the required industry standards and offered in varied dimensions and finishes. We also offer these in customized specifications to meet the requirements of our esteemed clients. A snow white Quartz natural stone countertop with swirls of dark gray, suggesting hints of pink and green veins. Extensively used Kitchen Countertop is providing by us to the customers. 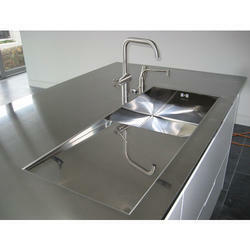 This Kitchen Countertop is completely and efficiently finished that satisfies the customers most. The smooth texture, non slippery surface and fantastic polishing of this Kitchen Countertop increases its demand rapidly. Ours is a reliable Manufacturer, Supplier and Exporter of Black Granite Counter Tops. Our Black Granite Counter Tops are best to be used for counter tops as these promise resistance against stains and heat. Along with this, Black Granite Counter Tops are easy to maintain and lasts for years. In the modern world, innovative and advanced styles of interior designs are adopted by most of the people. Modern Crockery Units are one of the very good examples of such a trend. A Crockery Unit is the predesigned shelf to keep your kitchenware conveniently. In simple terms Crockery units are the wardrobes for kitchenware. We are highly acknowledged organization engaged in presenting a remarkable range of Kitchen Countertop Marble.